British Airways has revealed the theft of customer data that compromised around 380,000 payment cards. “We are investigating, as a matter of urgency, the theft of customer data from our website and our mobile app,” the air carrier said in a statement on Thursday. 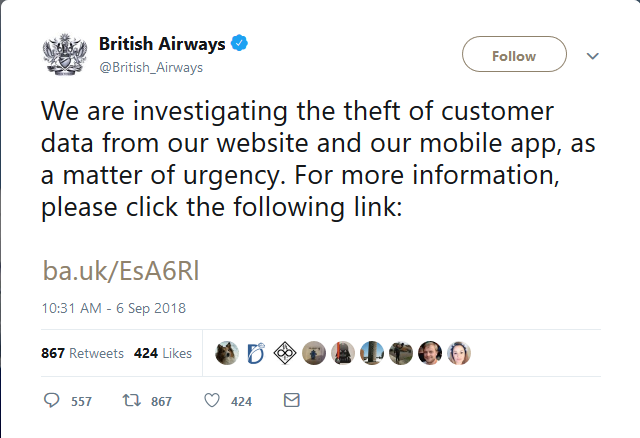 Details are sketchy at the moment but, as per the airline’s announcement, the breach affects customers who made bookings via the airline’s website, ba.com, or mobile app between August 21 and September 5 of this year. The compromised data includes customer names, email addresses, home addresses, and payment card details – but not travel or passport details. The United Kingdom’s largest airline, which carries up to 145,000 passengers every day, said that it will contact and reimburse all affected customers, as well as pay for a credit checking service. “We take the protection of our customers’ data seriously,” reads the statement. The airline also apologized for “the disruption that this criminal activity has caused”, adding that the incident has been resolved and it is safe to book flights and check in online. At any rate, users are advised to change their passwords on the airline’s website – and choose a unique and strong one, of course. Meanwhile, the airline’s chairman and CEO Alex Cruz told the BBC that the company will compensate the affected customers for “any financial hardship that they may have suffered” due to what he called a “sophisticated, malicious criminal attack”. The National Crime Agency said that it is aware of reports of the breach and that it is “working with partners to assess the best course of action”. Meanwhile, the Information Commissioner’s Office, which is the UK’s data protection watchdog, said that it is making enquiries about the incident. The airline was on the receiving end of another hack in 2015, when thousands of frequent-flyer executive club accounts were breached. No personal information was stolen, however. In May 2017, an outage of the airline’s computer systems – apparently caused by a maintenance contractor who had accidentally switched the power supply off – grounded hundreds of flights over a bank-holiday weekend. In July of this year, a software mishap resulted in disruptions to a number of the airline’s flights, with more than 3,000 passengers left stranded at London’s Heathrow airport overnight.